Pascal Cygan doesn’t make the cut. 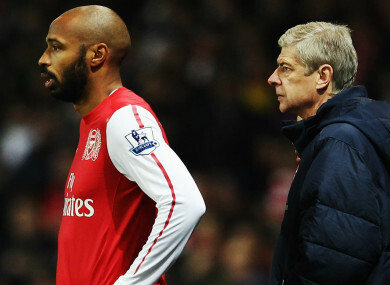 Golden period: Thierry Henry and Arsenal manager Arsene Wenger. ARSENE WENGER HAS confirmed he will leave Arsenal at the end of the season, bringing his 22-year spell in charge of the club to an end. The 68-year-old has endured some heavy criticism in recent years but could yet end his reign on a high, with his side preparing for a Europa League semi-final with Atletico Madrid next week. Much of the ‘Wenger Out’ campaign’s frustration has come from some of Arsenal’s transfers, with the likes of Manchester United, Manchester City and Chelsea spending significantly to leave the Gunners in the shade. There have been many times, though, when Wenger has got his transfer policy absolutely right. Vieira actually signed before the formality of Wenger’s switch from Grampus Eight to Highbury was completed, with the arrival of an AC Milan reserve slipping under the radar. But the rangy powerhouse midfielder would come to define Arsenal’s golden period under Wenger around the turn of the century as the beating heart of his teams. Physical and uncompromising out of possession; sublimely elegant with the ball at his feet – Vieira at his best was a phenomenon, guiding the Gunners to three Premier League titles and four FA Cup triumphs over the course of 406 appearances. The France international’s void was never adequately filled after he left for Juventus in 2005. Henry moved to Arsenal two weeks before his 22nd birthday in August 1999, already a World Cup winner but a player somewhat adrift following an unsuccessful year with Juventus. Wenger had some awkward questions to answer over shelling out £11million on a replacement for Nicolas Anelka who often played as a winger, especially as he went eight matches without a goal for the Gunners. But after coming off the bench to swivel and net a superb winner at Southampton, Henry never looked back. A bright but seemingly brittle talent would be transformed into the most feared forward in European football – all scything pace and ice-cool finishing. He left for Barcelona in 2007 as a two-time Premier League champion and three-time winner of the Football Writers’ Association Player of the Year award. He is Arsenal’s all-time record goalscorer with 228 in 377 matches. Very often when Henry was tormenting defences across the Premier League and Europe, it was his compatriot Pires stylishly providing the ammunition. Signed for £6m from Marseille in 2000, he initially followed Henry’s template of being an underwhelming replacement for a crowd favourite – Dutch winger Marc Overmars in this instance. He preceded Henry’s FWA wins by taking the gong in 2001-02. “I think I touched the sky,” Pires would later remark upon his performances during that campaign and, alongside Freddie Ljungberg, Dennis Bergkamp and Henry, he was the final piece in the puzzle of the iconic Invincibles attacking line of 2003-04. Perhaps Wenger’s most audacious signing, Campbell did not cost a penny. What his capture on a free-transfer from bitter rivals Tottenham in 2001 lacked in financial outlay it more than made up for in terms of bragging rights and hateful vitriol on either side of the north London divide. Campbell was a Premier League winner in his first season at Highbury and again, invincibly so, in 2003-04. In the first of those seasons, he played alongside long-serving club greats Tony Adams and Martin Keown before his alliance with Kolo Toure at centre-back suggested there was a glorious life beyond the defensive unit Wenger inherited from George Graham. The England international helped Arsenal go 995 minutes without conceding a Champions League goal en route to a 2-1 final defeat against Barcelona in 2006 in Paris, where he opened the scoring. Dutch striker Van Persie is arguably the last indisputably great piece of transfer business done by Wenger. He arrived for a paltry £2.75m from Feyenoord in 2004, spending his time learning under the likes of Henry before establishing himself as Arsenal’s attacking spearhead – their years in the trophy wilderness between the 2005 and 2014 FA Cup triumphs an ill-fitting return as Van Persie went about turning himself into the complete centre-forward under Wenger’s tutelage. He scored 132 times in 278 games for the Gunners – his phenomenal 37 across all competitions in 2011-12 leading to the FWA and PFA Player of the Year awards before Manchester United came calling to herald an acrimonious end to his time at Emirates Stadium. Email “Vieira to Henry: Arsene Wenger's best signings at Arsenal”. Feedback on “Vieira to Henry: Arsene Wenger's best signings at Arsenal”.